What is it about ranch dressing that people love so much? I admit, I’m a sucker for a good ranch dressing too. And my children love it. 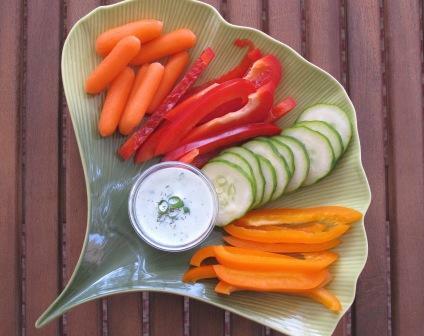 I’m fine with it being used as a dip with veggies – especially when it gets my children to eat more vegetables. And I love a good cucumber ranch dressing. So I decided to make my own – one that I can feel good about my children using as a dip (or soup! okay, not really a soup though it seems like it sometimes). I did put my own twist on it by adding some dill (fresh would be better – must try this summer). But the great thing is, you can easily adjust the seasonings to your liking and it is super fast to throw together. Put the milk and vinegar in a small bowl and set aside for 5-10 minutes to allow to thicken. Alternatively, use buttermilk in place of the milk and vinegar. Put the cucumber and green onions in a food processor and pulse until finely chopped. In a medium-sized bowl, combine the milk, cucumber, green onions and the remaining ingredients. Adjust seasonings to your taste. 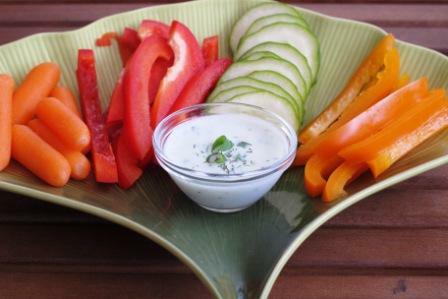 Chill and serve as a salad dressing or dip for raw vegetables. Makes about 1¼ cups dressing. For a thicker consistency, add a touch more Greek yogurt.